AUTHENTIC 35" in 90 cm HERMES Silk Scarf titled "Le Monde est 1 Fleuve by Dimitri Rybaltchenko featuring a striking World Map in stunning contrast with the most important rivers of the world, making a wonderful WALL DECOR for world travelers. 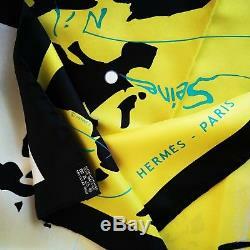 Size: 90cm x 90cm 100% Silk Color: Strong Yellow & Black & Orange & Turquoise. New never worn, no stains no pulls, no smell, plump hems. Everything we sell is 100% guaranteed authentic. We authenticate every item on our site before it is listed. We stand behind the authenticity of our items an we appreciate your trust! 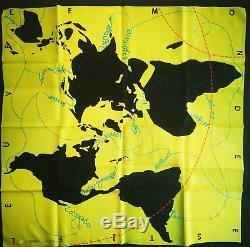 The item "NEW Mens HERMES Le Monde est 1 Fleuve SILK SCARF Dimitri R. World Map Wall Decor" is in sale since Tuesday, December 25, 2018.